With over 1750 steel beams in place, the 12-story tower at Two Drydock has topped off. The project will feature 225,000 square feet of office space, 9,500 square-feet of ground-floor retail as well as a 12,000 square-foot public plaza. Building amenities will include a rich first-level experience to include a cafe and craft brewing space, along with rooftop yoga area, and terrace with sweeping Boston and water views. An electrical permit has been issued for the upcoming 13-story building on Parcel Q1 in the Seaport. The building is set to contain 225,000 square feet of office space with 11,000 square feet of ground-floor retail. A 12,000 square foot public plaza will be constructed at the building's ground level fronting Drydock Avenue. Office workers will have access to an 11th-floor roof terrace facing the Boston skyline and a rooftop terrace at the penthouse level. Foundation work is underway for new office space coming to the corner of Drydock Avenue & Harbor Street in the Seaport. The building is set to include over 211,000 sf of office space along with 8,400 sf of ground floor retail. A new public plaza will also be built along Drydock Avenue. The $128 million project is expected to be complete in December 2019. Skanska, in partnership with project co-developer Twining Properties, has announced the sale of its’ Watermark Seaport luxury apartment tower in the Seaport District to CLPF Residences at Seaport LLC. The sale of Skanska’s equity ownership in the development, 42.75%, will reportedly amount to about $60 million. The transfer of ownership of Watermark Seaport to CLPF will reportedly occur in the first quarter of 2018. The 17-story Watermark Seaport was completed in the first quarter of 2016 and features 346 luxurious apartment residences, including 65 lofts in a six-story building adjacent to the main tower. Watermark Seaport, which is LEED Gold sustainability certified, also includes 25,000 square feet of ground-floor retail, including an 11,590-square-foot CVS Pharmacy and multiple dining options. Resident amenities at Watermark Seaport include a roof deck with views of the Financial District and Boston Harbor, a wellness studio, a resident lounge, an innovation lab and underground parking. Both full-body indoor cycling and lifestyle studio SoulCycle and Indian-inspired restaurant Tikkaway Grill have opened new locations at the new 440,000 square foot 101 Seaport Class A office and retail building in the Seaport District. SoulCycle is the Seaport's first fitness studio and features 57 bikes as well as a lifestyle boutique featuring SoulCycle performance and leisure clothing. Tikkaway Grill is a "self-directed journey through the traditional tastes and flavors of India," featuring build-it-yourself rice bowls, salad bowls and whole-wheat Roti wraps. Opening this month at 101 Seaport will be Juice Press and Yoki Express, at which point 101 Seaport's 25,000 square feet of street-level retail will be fully occupied. Also open at 101 Seaport are Aceituna Grill, by CHLOE., Chipotle Mexican Grill and Starbucks. 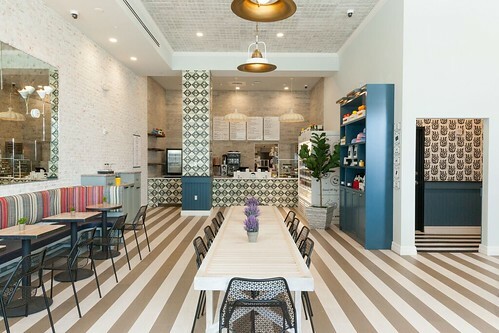 by CHLOE., a plant-based, fast casual restaurant with locations in New York City and Los Angeles, will open this Thursday (February 23rd, 2017) at the recently completed 101 Seaport office and retail building in the Seaport District. by CHLOE. will front onto the upcoming Harbor Way pedestrian passage, which will ultimately link Summer and Congress Streets and future development to the waterfront. by CHLOE. will feature creative, fully vegan recipes free of meat, dairy, and egg products as well as of saturated animal fat, added preservatives, and artificial flavors. by CHLOE. 's menu will include 4 exclusive Boston-themed vegan items: Clam Chowder, Lobster Roll, Boston Cream Whoopie Pie and Boston Cream Pie Chill. Beer and wine will be served in addition to fresh pressed juices and smoothies. by CHLOE. will be open 7 days a week, from 11am to 10pm Monday through Friday and from 10am to 10pm on Saturday and Sunday, at 107 Seaport Boulevard. The 2,400 square foot Seaport location will seat 43 people; outdoor seating will be added as well. A second Massachusetts location of by CHLOE. 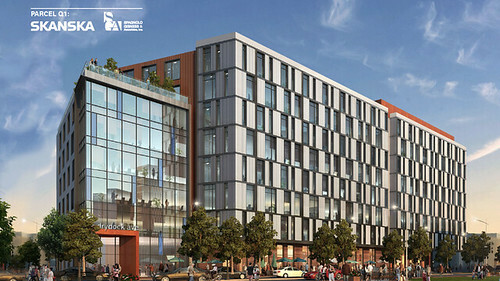 will open this Spring at the recently completed Van Ness mixed-use development in the Fenway. WS Development has announced that Kendall Square-based Mediterranean food restaurant Aceituna Grill will open its' second location at 101 Seaport in the Seaport District on Thursday (February 9th), becoming one of 101 Seaport's 8 confirmed retail offerings. Aceituna's 2,500 square foot space will seat 49 people and will be open for lunch and dinner Monday-Saturday. Aceituna is the latest retail offering to open in 101 Seaport's 25,000 square foot ground-floor retail component. Other offerings include the now-open Chipotle Mexican Grill and Starbucks, with SoulCycle, By Chloe, Juice Press, Tikkaway Grill and Yoki Express also opening in the coming months. The Parcel Q1 office and retail development was approved at Thursday (December 15th)’s Boston Planning & Development Agency (BPDA) Board Meeting. Located in the Seaport District’s Boston Marine Industrial Park (BMIP), the $110 million project will construct a 13-story, 298,700 square foot building featuring 211,700 square feet of office space with 8,400 square feet of ground-floor retail. Construction is expected to commence in the third quarter of 2017, with expected completion in the third quarter of 2019. Skanska has released new details and renderings for the proposed Seaport District office building at Parcel Q1, located in the Boston Marine Industrial Park (BMIP) across from the proposed Marine Wharf Hotel steps to the Innovation and Design Building, in a Project Notification Form (PNF) filed with the Boston Redevelopment Authority (BRA) today; the following is a link to the PNF. Designed by SGA, the proposed building would be 13 stories tall with 211,700 square feet of office space, 8,400 square feet of ground-floor retail and a new 12,900 square foot public plaza fronting Drydock Avenue. Construction of the proposed building is anticipated to commence in the third quarter of 2017, with expected completion in the third quarter of 2019. Additional information about the proposed building can be found above. Skanska bought the 101 Seaport parcel in 2013 for $33 million. Union Investment also recently bought the Hoffman Building on Lovejoy Wharf for $150 million. More information about 101 Seaport is posted below.